Tjallingii secures the blue jersey for tomorrow by winning the final climb of the day (Knocknaguillagh) - another three points for the Belkin rider, who easily beat Fedi and Armee. 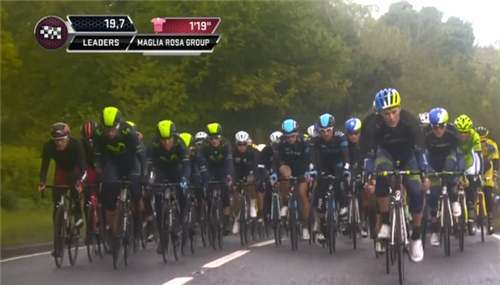 Peloton eases over the top of the climb 70 seconds behind. There is a sprint yet to come at Carrickfergus. Noticeable that BMC Racing and Movistar, who do not boast a sprinter worthy of the name, have moved to the front keen to avoid any accidents for Cadel Evans and Nairo Quintana. Andrea Fedi wins the sprint in Carrickfergus but you would think the red jersey will be won at the finish line. 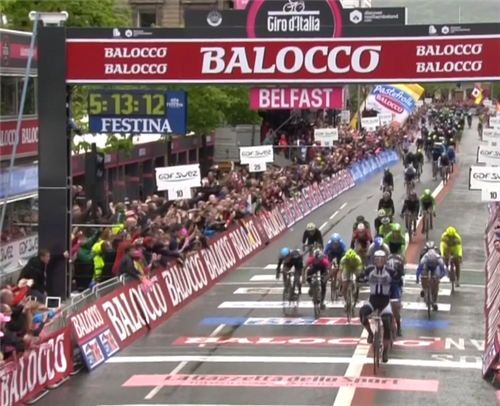 Rain heavy where the peloton is riding through but dry in Belfast as Francesco Chicchi, one of the leading Italian sprinters, has an untimely mechanical. Looks like Fedi and Armee have given up the ghost as well. They can't keep up with the Dutchman, whose team-mate Jos van Emden has suffered a puncture at the back. Chris Sutton pulls some horrific faces on the front for Sky - setting this up for Swift? Final kilometre - see you at the finish line! That was all too easy for the big German. He had a clear run to the line and got the first run on Bouhanni, who appeared to take second ahead of Nizzolo. We await confirmation of the final result. Because of a gap in the peloton, it appears Michael Matthews will be taking the pink jersey from his Orica Greenedge team-mate Svein Tuft. Awaiting confirmation. And here is it - the man they know as Bling is the new leader. Australia celebrates!
. @blingmatthews assumes the maglia rosa from Svein Tuft. 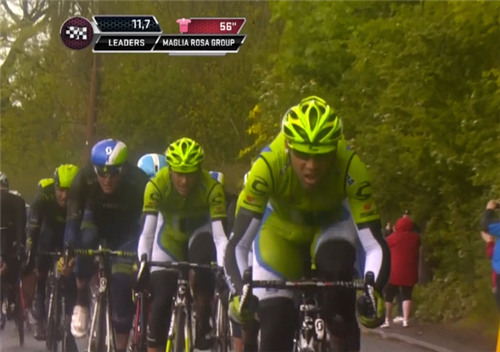 That's two ORICA-GreenEDGE riders in pink in two days! I think the people of Northern Ireland may want to adopt Marcel Kittel. They loved that win. With that, Belfast is done.